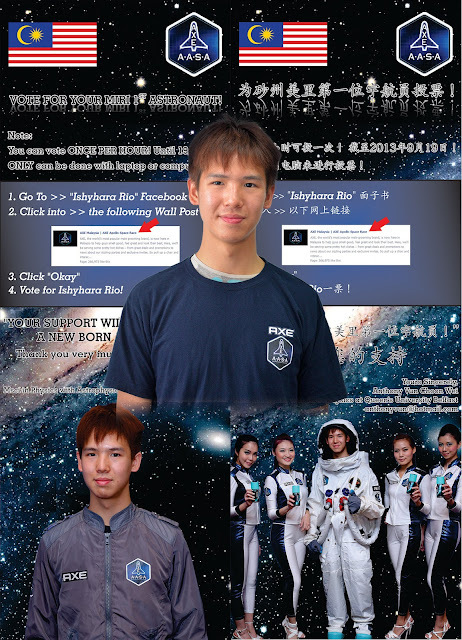 William Ting: We need your vote to give our Miri boy a chance to go into space! We need your vote to give our Miri boy a chance to go into space! Indeed, this is a chance of a lifetime and a chance of a lifetime for you to be able to vote for Anthony Vue, our local Miri boy, currently studying in Belfast Queen's University, for his challenge to beat the rest of the four contestants in Malaysia to represent Malaysia. His facebook name is Ishyhara Rio and make sure that you don't vote the wrong person! Lynx is offering the chance to travel into space with the launch of its 2013 Lynx Apollo range. The Unilever brand is looking to put the Lynx Effect into orbit by giving people the chance to win place on a space trip, in support of the launch of its new 2013 fragrance. There will be 22 places up for grabs globally, with the competition running in 77 countries around the world.. Entry was done through the lynxapollo.com website. The top voted candidates will go forward to the Lynx Space Academy for a challenge weekend in each national states respectively, whittling down the candidates with a further Global space camp in Florida before the final winning astronaut is picked. Stage 1: Online voting through lynxapollo.com. Stage 2: National Space Camp starts where candidates compete in their own countries respectively to select representatives to compete in Global Space Camp in Florida. Finally, of 100%, the top mark will be selected as top 1 to represent Malaysia to the Global Space Camp. Stage 4: Top 22 Candidates in Global Space Camp will be selected to represent respective countries as astronauts being launched into space.